UNITED NATIONS- A new United Nations report issued here Thursday said that the world population is increasingly urban with more than half living in urban areas at present. According to the report, 54 percent of the world’s population nowadays live in urban areas, a proportion that is expected to increase to 66 percent by 2050. 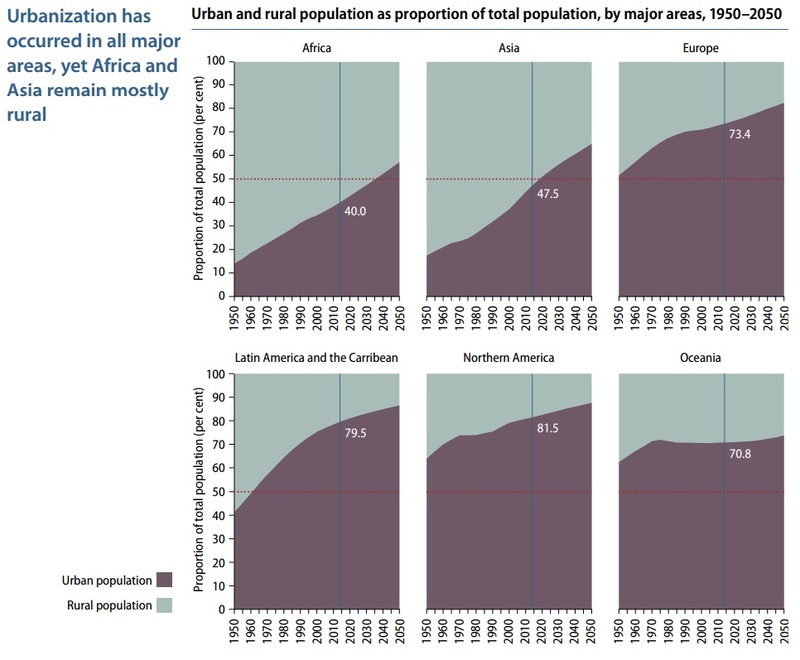 The UN projections show that urbanization combined with the overall growth of the world’s population could add another 2.5 billion people to urban populations by 2050, with close to 90 percent of the increase in Asia and Africa. 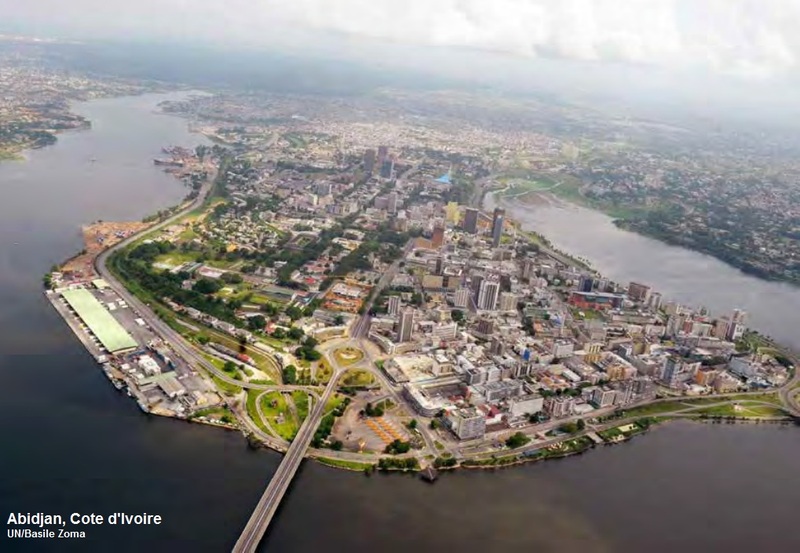 The 2014 revision of the World Urbanization Prospects produced by the UN Population Division of the Department of Economic and Social Affairs (DESA) noted that the largest urban growth will take place in India, China and Nigeria. The three developing countries will account for 37 percent of the projected growth of the world’s urban population between 2014 and 2050. 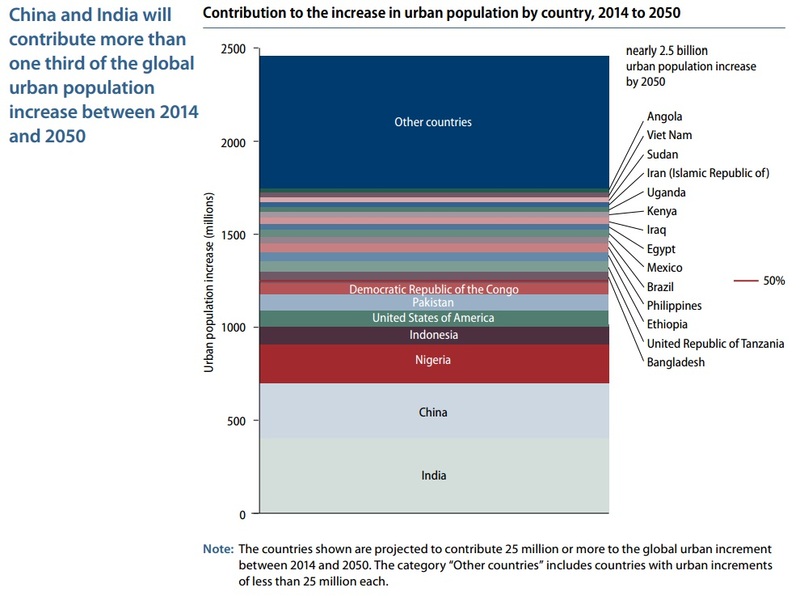 By 2050, India is projected to add 404 million urban dwellers, China 292 million and Nigeria 212 million, said the report. 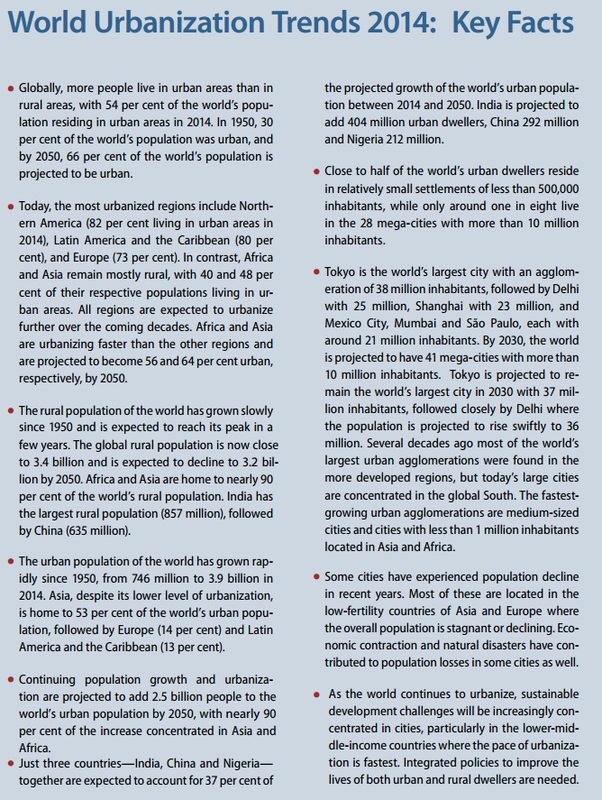 The urban population of the world has grown rapidly from 746 million in 1959 to 3.9 billion in 2014. 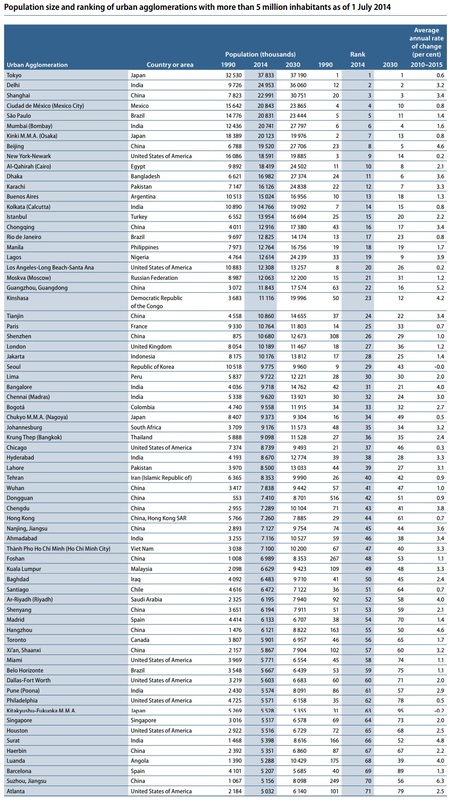 Asia, despite its lower level of urbanization, is home to 53 percent of the world’s urban population. “Managing urban areas has become some of the most important development challenges of the 21st century,” said John Wilmoth, director of the Population Division of the DESA, at a press conference here for launching the report. The report noted that in 1990, there were 10 “mega-cities” with 10 million inhabitants or more, which were home to 153 million people or slightly less than seven percent of the global urban population at that time. 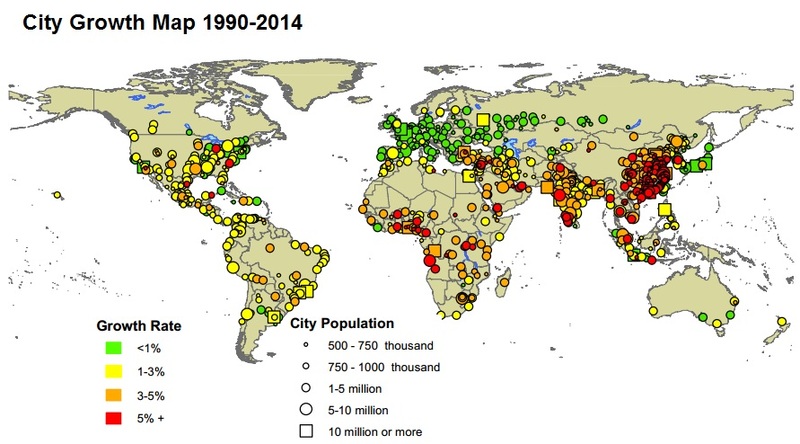 In 2013, there were 28 mega-cities worldwide, home to 453 million people or about 12 percent of the world’s urban dwellers. Of today’s mega-cities, 16 are located in Asia, four in Latin America, three each in Africa and Europe, and two in Northern America. 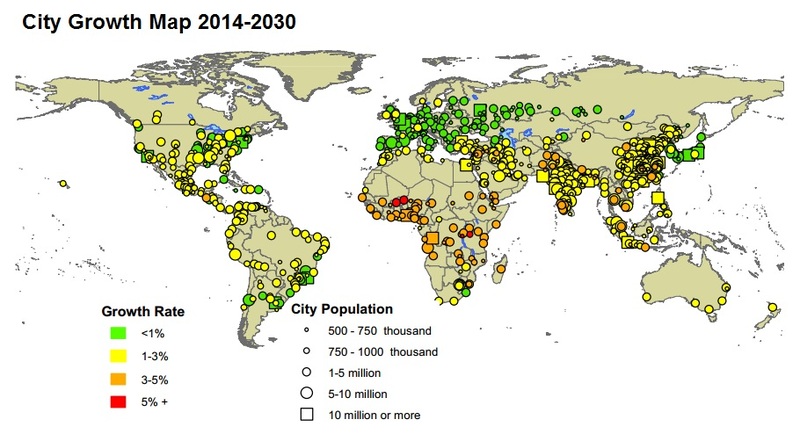 By 2030, the world is projected to have 41 mega-cities with 10 million inhabitants or more. Tokyo remains the world’s largest city with 38 million inhabitants, followed by Delhi with 25 million, Shanghai with 23 million, and Mexico City, Mumbai and Sao Paulo, each with around 21 million inhabitants. Osaka has just over 20 million. The New York-Newark area and Cairo complete the top 10 most populous urban areas with around 18.5 million inhabitants each. Although Tokyo’s population is projected to decline, it will remain the world’s largest city in 2030 with 37 million residents, followed by Dehli, whose population is projected to rise swiftly to 36 million in 2030. While Osaka and New York-Newark were the world’s second and third largest urban areas in 1990, they are projected to fall to the 13th and 14th positions by 2030, respectively, as mega-cities in developing countries become more prominent. 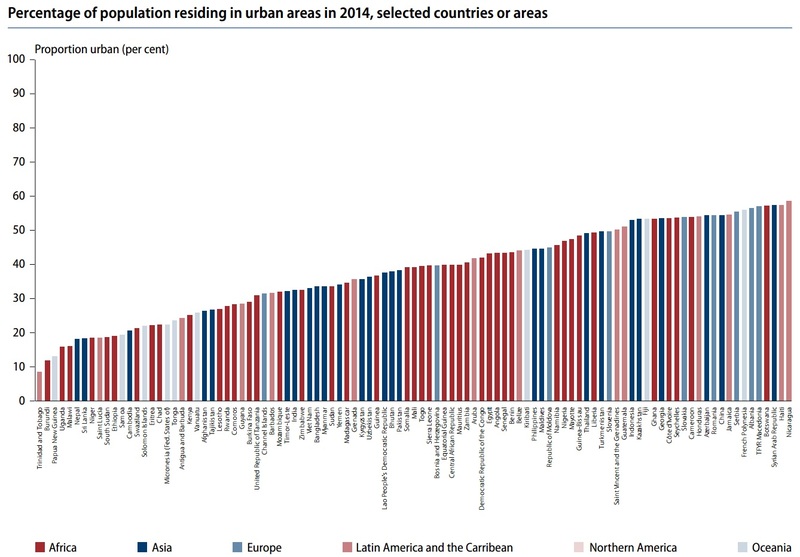 Overall, nearly half of the world’s 3.9 billion urban dwellers reside in relatively small settlements with fewer than 500,000 inhabitants, while only around one in eight live in the 28 mega- cities with 10 million inhabitants or more. 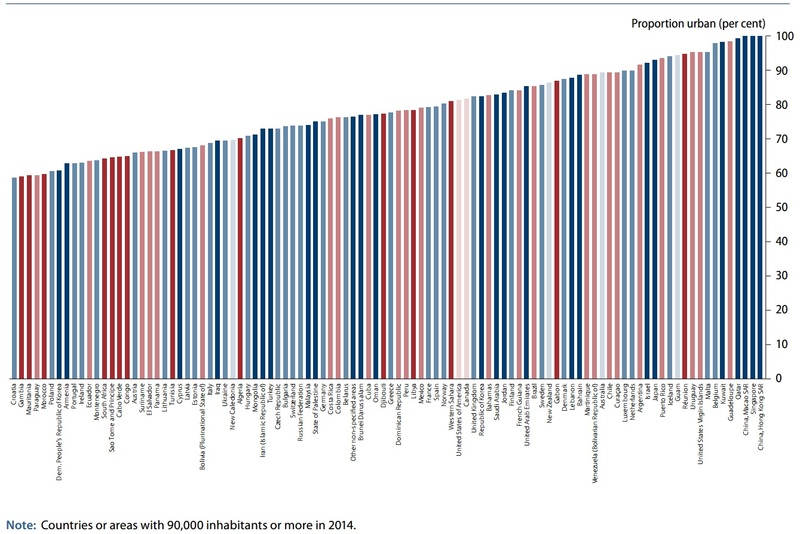 Many of the fastest growing cities in the world are relatively small urban settlements. On the other hand, the rural population of the world has grown slowly since 1950 and is expected to reach its peak around 2020. 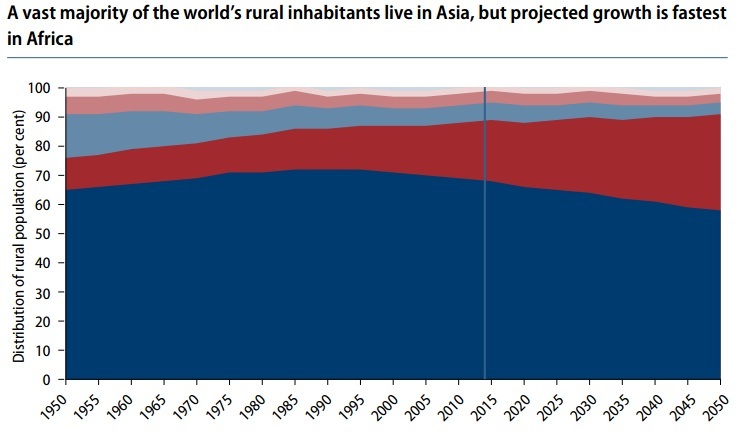 The global rural population is now close to 3.4 billion and is expected to decline to 3.1 billion by 2050, the report said. While Africa and Asia are urbanizing rapidly, the regions are still home to nearly 90 percent of the world’s population. India has the largest rural population with 857 million, followed by China with 635 million. The new UN report noted that a successful urban planning agenda will require that attention be given to urban settlements of all sizes. Cities offer important opportunities for economic development and for expanding access to basic services, including health care and education, for large numbers of people through proper management. Providing public transportation, as well as housing, electricity, water and sanitation for a densely settled urban population is typically cheaper and less environmentally damaging than providing a similar level of services to a dispersed rural population. 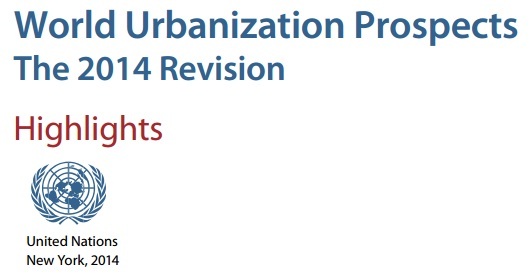 Observers say the 2014 revision of the World Urbanization Prospects provides new and updated information on global urbanization trends and city growth. Such information is vital for setting policy priorities to promote inclusive, equitable and sustainable development for urban and rural areas alike. Recognizing the importance of smaller cities and towns, the latest revision also expands the number of cities and provides, for the first time, population estimates and projections for all of the world’s urban settlements with 300,000 inhabitants or more in 2014. New York, NY United Nations- The world today has its largest generation of youth in history – 1.8 billion young people, mostly in developing countries – with enormous potential to help tackle the major challenges facing humanity. But too many are denied their rightful opportunities to get a quality education, find decent work, and participate in the political life of their societies. World Population Day is an opportunity to renew our commitment to help young people unleash progress across society. Action is urgently needed. Too many young people lack resources they need to lift themselves out of poverty. I am particularly concerned about adolescent girls who may face discrimination, sexual violence, early marriage and unwanted pregnancies. And even among those young people fortunate enough to receive university degrees, many find themselves without employment or stuck in low-wage, dead-end jobs. The solution lies in investments in health, education, training and employment for young people as they undergo the critical transition to adulthood. This will improve prospects for their lives and our common future. Young people themselves are speaking out. Earlier this year, more than 1,000 youth organizations endorsed a Global Youth Call, welcomed by 40 countries, which recommends youth-focused goals and targets in the post-2015 development vision. Next year marks the deadline for reaching the Millennium Development Goals, shaping the successor agenda, and adopting a meaningful legal agreement on climate change. Youth have a major role in all these processes. The year 2015 also marks the 20th anniversary of the World Programme of Action on Youth. Its practical guidelines for national action and international support remain relevant today. In particular, to fully carry out this Programme of Action, governments must respect the human rights and fundamental freedoms of all youth and respond effectively to any violations. On this World Population Day, I call on all with influence to prioritize youth in development plans, strengthen partnerships with youth-led organizations, and involve young people in all decisions that affect them. By empowering today’s youth, we will lay the groundwork for a more sustainable future for generations to come. The term “urban agglomeration” refers to the population contained within the contours of a contiguous territory inhabited at urban density levels without regard to administrative boundaries. It usually incorporates the population in a city or town plus that in the suburban areas lying outside of, but being adjacent to, the city boundaries. Whenever possible, data classified according to the concept of urban agglomeration are used. However, some countries do not produce data according to the concept of urban agglomeration but use instead that of metropolitan area or city proper. If possible, such data are adjusted to conform to the concept urban agglomeration. When sufficient information is not available to permit such an adjustment, data based on the concept of city proper or metropolitan area are used. The sources listed online indicate whether data were adjusted to conform to the urban agglomeration concept or whether a different concept was used.